With Lionheart as the new alpha, the streets of London are quiet. But above the realm, mischief is brewing. While airship pirates are a common plague upon the kingdom, the Airship Fenrir proves particularly troublesome–especially on a full moon. Clemeny must take to the skies before these shape-shifting Vikings kick off a new Ragnarok. Easier said than done now that she’s down one good eye, a partner, and not to mention the fact that she gets motion sick. On top of that, the new scar across her face makes Clemeny feel like she’ll have better luck intimidating her foes than finding a beau. But Agent Edwin Hunter, recently assigned as head of Clemeny’s division, is proving to be an interesting prospect. Despite her apprehensions, it’s up to Agent Louvel to chase Fenrir across the heavens. Alphas and Airships is a retelling of the Little Red Riding Hood fairy tale set in Melanie Karsak’s bestselling steampunk universe. 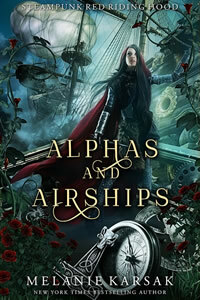 Alphas and Airships is Book 2 in the Steampunk Red Riding Hood series.